I recently won an Italeri 1/72 H-21C in a raffle and inside the box was this nice Eduard external detail set for the kit. This is a fairly extensive set that even goes so far as to have replacement windows for the cabin and one of the side windows as well. The replacement cabin windows have the holes in the middle for the troops inside to use to fire from if the helo is landing 'hot'. Other bits are various screens, which will come in useful over the engine area as the kit doesn't provide them as well as a cargo hook apparatus and a rather complex looking mount for long range fuel tanks. The kit doesn't come with them but the instructions state that those for a T-33 are what you want. 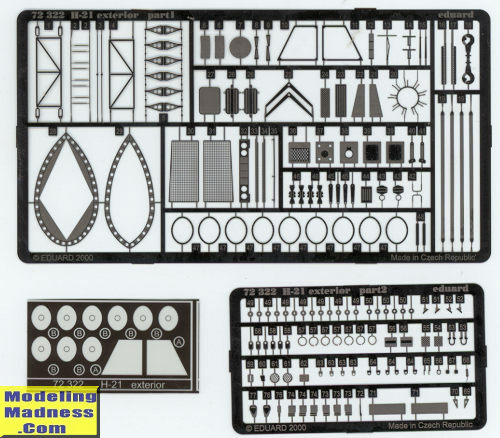 As you can see from the scanned image, the parts have to be near 100, most of them very small and fit pretty much everywhere on the airframe that you can think of. I'd have to say that most who actually use this set will probably stick with the larger items and those that add in missing items. It is a most complete set and one that those who don't mind working with p.e. should seek, even if they don't use it all. As with all of these sets, Eduard provides a comprehensive application guide that indicates any modifications required to use certain parts.